# 1 Sensor: Nikon DF offers better sensor since it features better High ISO range Sensor range(204800 vs 102400) , Nikon DF will give you cleaner RAW and JPEG files when compared to 5D Makr III at high ISO levels. # 2 AF System: Canon 5D Mark III offers better AF system with 61-point autofocus and up to 41 cross-type AF points, Nikon DF is limited to 39 distinct AF points, including nine cross-type sensors. # 3 Shutter: Canon 5D Mark III offers more shutter range (1/4000 vs 1/8000) and Fast Top-Continuous shooting speed o(5.5 vs 6fps). 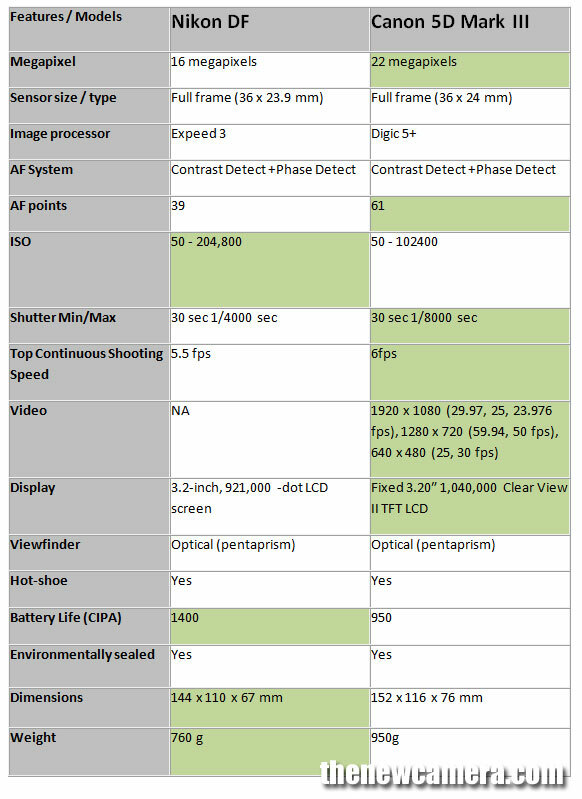 # 4 Video: Canon 5D Mark III offers Video recording at 1080/30p, 24p, 25p; 720/60p, 50p; 480/30p, 25p. – Both All i-frame and IPB compressions are supported as well as the standard H.264/MPEG -4 AVC codec, No Video Recording option available at Nikon DF. # 5 Display: Canon 5D Mark III offers high-resolution display compared to Nikon DF. Verdict: Canon 5D Mark III and Nikon DF both offers excellent core specification, Nikon DF will give you bit better image quality at HIGH ISO Range on the other hand Canon 5D Mark III offers advance AF system, better shutter range and Video recording options. Based on overall core specification we recommend you to buy Canon 5D Mark III, Nikon DF offers you classic controls and design with limited performance, if Nikon DF fulfills your need go-ahead and buy Nikon DF.